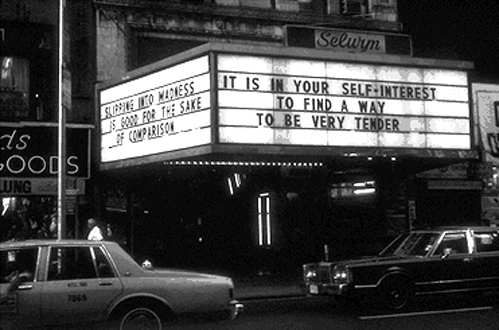 When I woke up this morning I immediatly had to think about a work of Jenny Holzer at Times Square. The reason for this is not that I am a fanatic art lover or so(maybe a little) but the dream I had, about shoes, clothes, the common stuff. 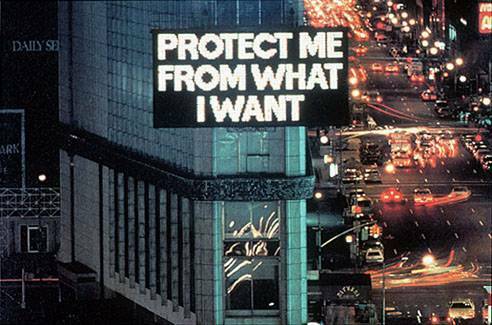 This work of hers sais: "Protect me from what I want." I didn't remember who made it so I tracked it at google. When I knew who she was again, I descided to share it with you all. This is because my blog normally is about things I like, things I want, art and that kind of stuff. This tells me not to want everything. The work at times square is a projection that looks like an add. Normally, adds tell you about all the things that you ABSOLUTELY want, need or like. This add tells you not to. This is what I like so much about this work. Jenny Holzer is an conceptual artist, this means that the thought in the work of art is more important than the beauty of it. A conceptual artpeace doesn't have to be beautiful. 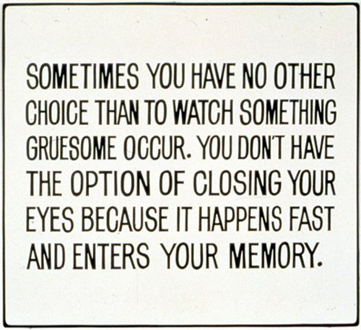 Jenny Holzer makes you think about something. 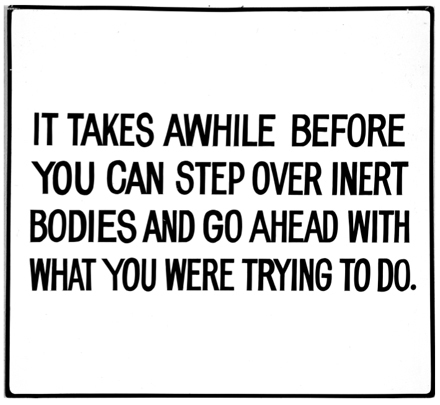 Not only because her works consist an unnerving statements, but also because you can't deny it, you can't avoid them because, well, they're just there. In the subway, in the streets, everywhere, and you just see them. Her works are meant to stay in your mind during your day so that you figure it out later, as I did this morning.